I’ve eaten probably more than my share of cookie dough in my lifetime. If I’m making cookies, you can safely wager that I’ll be trying at least a bite of unbaked dough. Of course, we all know that eating cookie dough is not the best of ideas. But, I bet I’m not the only one who’s guilty. There’s some great news for those of us who like to sample from the mixing bowl. Lindsay of the fabulous Love and Olive Oil has a brand new cookbook just for us. It’s called The Cookie Dough Lover’s Cookbook, and it’s packed with recipes for cookies, cakes, and other treats. 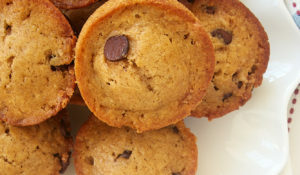 Every recipe has a cookie dough component that’s made without eggs. So, we get to have our cookie dough fix the right way. 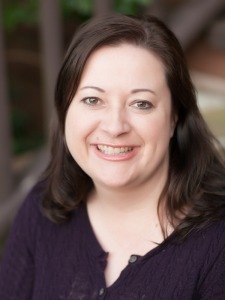 To celebrate this new cookbook, which will be available June 5th, Quirk Books has asked some food bloggers to come up with our own creations based on Lindsay’s eggless cookie dough. All throughout June, you’ll be able to follow all the recipes in what is being billed as The Cookie Dough-lympics. Amber from Awake at the Whisk started carrying the torch this past Friday. It passes through BoB today, moves on to Betty at The Queen’s Notebook tomorrow, and keeps going all month. To keep up with all the recipes, you can follow me on Twitter or Pinterest. For my cookie dough creation, I used Lindsay’s chocolate cookie dough recipe to dress up a no-bake cheesecake. 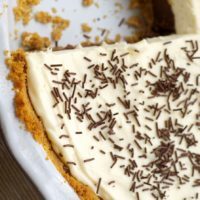 Traditional graham cracker crust is topped off with a thick layer of chocolate cookie dough. Then, creamy cheesecake goes on top of that. Yeah, it’s just as good as you think it is. 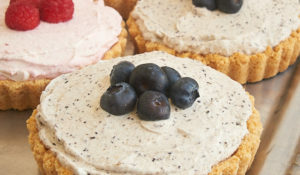 This is a no-bake cheesecake with an asterisk. I like to bake the crust, but it’s not essential that you do. It holds together a bit better when it’s baked, which I found to be helpful for spreading the cookie dough layer on top. While I have the attention of the cookie dough fans out there, I have some great news. One lucky Bake or Break reader will receive their own copy of The Cookie Dough Lover’s Cookbook. UPDATE: Contest has ended. Check back for more great giveaways! 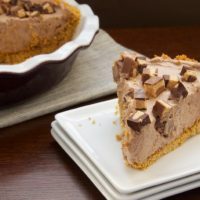 Rich chocolate cookie dough combines with a sweet no-bake cheesecake for an irresistible dessert. Preheat oven to 350°F. Grease a 9-inch pie pan. 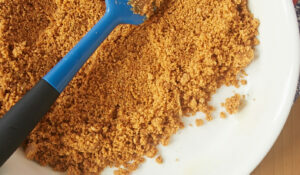 Mix together the graham cracker crumbs, brown sugar, and butter until combined. Press into bottom and up sides of prepared pan. Using an electric mixer on medium speed, beat the butter, sugar, and brown sugar until light and fluffy. Mix in the cream and vanilla. Add the cocoa, flour, and salt. Mix on low speed until combined. Spread the dough over prepared crust. Refrigerate while making the cheesecake. Using an electric mixer on medium speed, beat the cream cheese and sugar until fluffy. Mix in the vanilla. Whip the cream until soft peaks form. Gently fold into cream cheese mixture. Spread evenly on top of the cookie dough layer. Garnish with chocolate, if desired. Refrigerate about 3 hours before serving. Keep refrigerated. You may find it’s easier to slice the cheesecake if you let it stand at room temperature for about 10 minutes. Eggless Cookie Dough recipe adapted from The Cookie Dough Lover’s Cookbook. my fav cookie is currently lemon ricotta cookies with a lemon glaze, yum. My favorite is a good old fashioned chocolate chip cookie with a tall glass of cold milk. My favorite cookies are Brown Butter Chocolate Chip Cookies! Right now I’m loving any cookie baked in my muffin top pan. Gotta love when ONE cookie is enough to fill you up! Choc chip bc the dough is the best!! A skillet cookie with pretzel M&Ms is pretty perfect! chocolate chip, tried and true! My favorite cookie is the vanishing oatmeal raisin cookie. The recipe is inside the cover of the Quaker oatmeal box. I love my chocolate chip oatmeal cookie recipe. It’s a keeper!! My favorite cookie to make is a rolled oatmeal cookie from my grandmother’s recipe. I love baking oatmeal and raisin cookies! I love baking good ol’ chocolate chip cookies. My favorite is lemon dough with white chocolate chips. Adding dried strawberries, if you can find them, makes the cookies even better! Favorite cookie is double chocolate chip. Chocolate chip cookie dough with some added almonds and coconut! Yumyum. My favorite cookie is oatmeal with dried cranberries. This cookie dough cheesecake looks incredible! 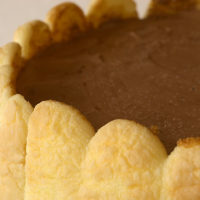 I love that it’s with a layer of chocolate cookie dough, adds a little something extra! I love so many. But chocolate crinkle cookies are my families favorite ! White Chocolate Macadamia Nut cookies are my fave to make, with Peanut Butter Chip cookies in CLOSE second! I love making plain ‘ol Chocolate Chip Cookies. I love puffy snickerdoodle cookies! My favorite cookie to bake is Oatmeal Raisin – this particular recipe calls for refrigerating the dough overnight and the raisins soften up a bit – I love eating the dough as much as the baked cookie! Whoa! This is insane!! Yum! Gooey Chocolate Cookies (made w/ semi-sweet chocolate chips)..for some reason, my mom-in-law makes the best! Oh, yum. mmm…this cheesecake sounds delicious! just in time for summer. Turning on the oven when it’s 100 degress outside makes me sad. my favorite cookies to bake are ginger chewies. My favorite cookies to bake are chocolate with PB chips…they are my father’s favorite to eat! I like to make a sugar cookie with a capful of peppermint oil, especially around the holidays. They’re familiar but surprising! Chocolate Chip-Oatmeal. So many choices…hard to pick just one! My favorite cookie to make are pizzelles…brings back wonderful memories of my grandma! Oh, my Great Auntie Bee’s peanut butter cookies rolled in sugar and flattened with the tines of a fork. The best! My favorite cookie has always been the chocolate chip cookie! My favorite cookie is the classic chocolate chip cookie – reminds me of when Mom used to let me like the mixing spoon. Good times! I like making Rolo cookies- they taste delicious and come out looking great every time. They’re a great recipe for impressing people. Chocolate chip cookies as always are my very favorite! 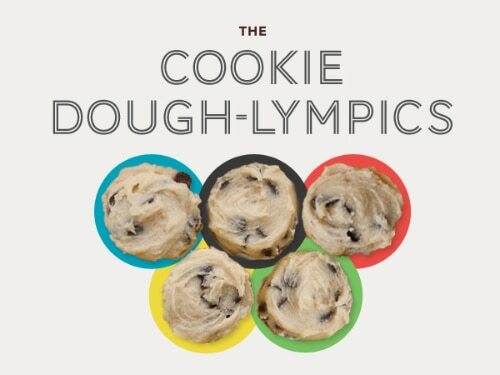 The Cookie Dough-lympics?!?! OMG that’s so exciting!! I will absolutely be following this! My hands down fave cookies are gingersnaps. I love baking Oatmeal Raisin cookies. Yum! Gosh, this recipe looks amazing! Can’t wait to try it this weekend! My all-time favorite cookie to bake is chocolate chip, simple but never a disappointment. My favorite cookie is oatmeal with white chocolate chips, dried cranberries, and pecans. My favorite is oatmeal chocolate chip with pecans! Fantastic photos! I’m so thrilled to get to know some new blogs through the Dough-Lympics. 🙂 Too fun! I love Quirk Books. Chocolate chip, still warm from the oven!!!! The cookie dough Olympics?! I love it! My favorite cookies, also to bake, are chocolate chip cookies. No matter what I try, I always go back to the standard oatmeal raisin cookie. I just love ’em. 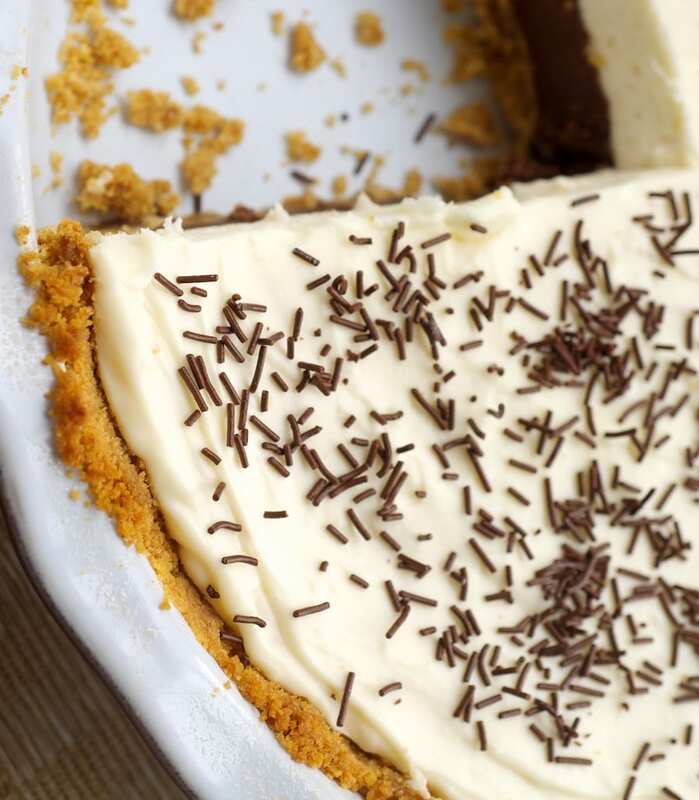 Could eat a million of ’em with a glass of milk…Can’t wait to try this cheesecake! Chocolate chip is my all time favorite, but I have been on a peanut butter kick lately. 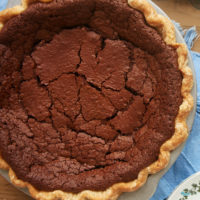 I am going to try this pie out this weekend. Can’t wait. Chocolate Chip — there are some many different recipes out there it is fun to see how each turns out and what the taste differences are! My favorite cookie to bake has to be red velvet crinkle cookies. 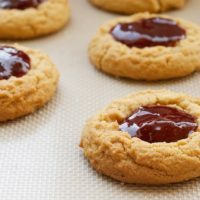 Simple, easy cookie to make. Though they are a “cheat” cookie to make, they are a crowd pleaser. I love to bake my Grandma’s old fashioned butter cookies. As they rise in the oven, the smells remind me of childhood Christmases spent in her house. Many years ago I had to contend with a cranky baby who’s nap never gave me enough time to make drop cookies. 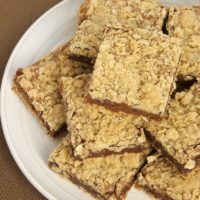 I turned to bar cookies and have always loved to bake Apricot Bars – a crubmly, buttery oatmeal crust with delicious jam in the middle. They can be made in less than 45 minutes but taste and look impressive. I love to make chocolate chip cookies… mostly because I love to eat them! Hands down best cookie? Monster Cookies!! PB, oats, M&Ms, chocolate chips,…. Heaven! I love to bake chocolate chip cookies. I love making snickerdoodles. The house smells amazing afterwards. Chocolate chip, although snickerdoodles are also pretty amazing. I love making chocolate chip cookies because nothing is so simple and beloved as those delicious cookies. This cheesecake does sound pretty good too! I love anything cookie dough and it is so veratile. My favorite cookies to bake are white chocolate cranberry oatmeal cookies. They smell so good! This looks yummy! Lovely post. 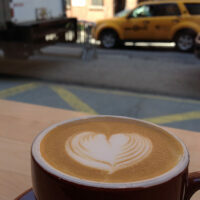 A belated thank you for the kind mention and link to my other blog. What a fun cake this was to make. 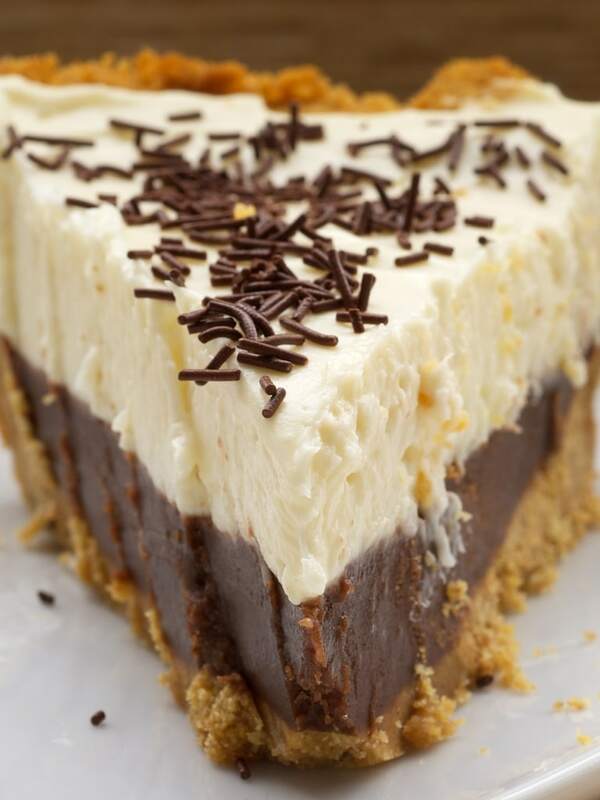 Your chocolate cookie dough no-bake cheesecake looks divine. I must try it. Thanks for sharing!